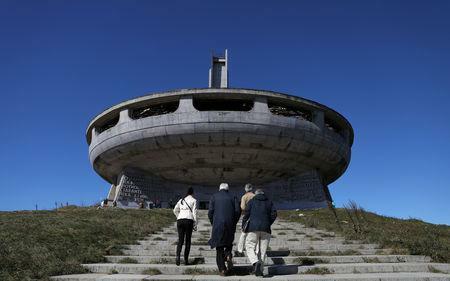 SOFIA (Reuters) - A Brutalist concrete tribute to socialism, Bulgaria's UFO-like Buzludzha Monument has sat crumbling and abandoned atop a peak in the Stara Planina mountains since the collapse of communism in 1989. 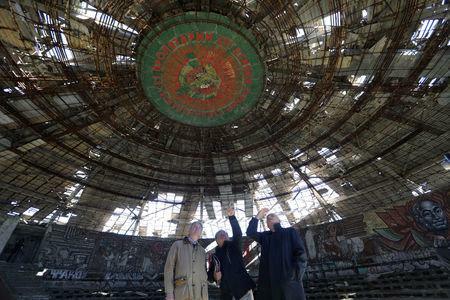 Now, three decades later, badly damaged by weather and vandalism, European cultural heritage organisation Europa Nostra is keen to have the round monument and its 70-metre-tall red star-topped tower renovated and opened to the public. 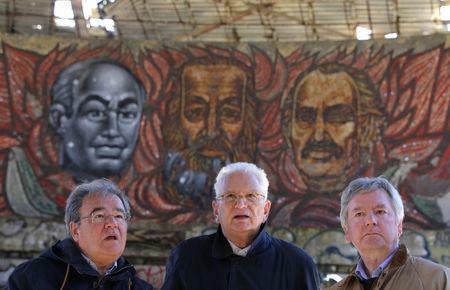 "Buzludzha is unbelievable," Europa Nostra board member Graham Bell told Reuters while visiting the site. "It is unbelievably amazing... but I am shocked with its condition," Bell said, as he inspected panels fallen from the domed ceiling of the monument's round ceremonial hall. Beneath the hammer and sickle at to centre of the dome, intricate mosaics along its curved walls depict communist propaganda and graffiti engulfs the original murals of Karl Marx, Vladimir Lenin and Bulgarian leaders of the past. The Buzludzha was built in 1981 under all-powerful Communist leader Todor Zhivkov, its mountaintop setting offering views across some of Bulgaria's most spectacular landscapes. Some 70,000 tonnes of concrete and 3,000 tonnes of steel were used to create the monument to the Bulgarian Communist Party. The work took eight years and involved more than 6,000 engineers, artists, designers, sculptors and soldiers as well as a large number of volunteers. Listed among Europe's most endangered heritage sites, Europa Nostra said its Brutalist architecture, iconography and mosaics are worth rescuing and that it would turn to the European Union and Bulgarian government for the funding needed. Currently, the abandoned site attracts only the most intrepid admirers as it is officially closed and requires a steep pilgrimage to the site at an altitude of more than 1,400 metres. Some Bulgarians are less fond, and believe it should be demolished, arguing that it represents a painful legacy of an oppressive regime that should not be glorified after killing tens of thousands. But Bulgarian architect Dora Ivanova, founder of the Buzludzha Monument Preservation Project, says Bulgarians need an objective and critical narrative of the country's socialist past. "The monument is the most suitable place for this," she said. "People know very little about this period. The monument should be preserved to keep the history and narrate it." Europa Nostra officials have met Culture Ministry officials and local authorities, aiming to find a way to save the monument. "Today, it has not to be considered anymore like a communist monument, but as an achievement of architecture," said Laurent Levi-Strauss, another board member at the Netherlands-based Europa Nostra.